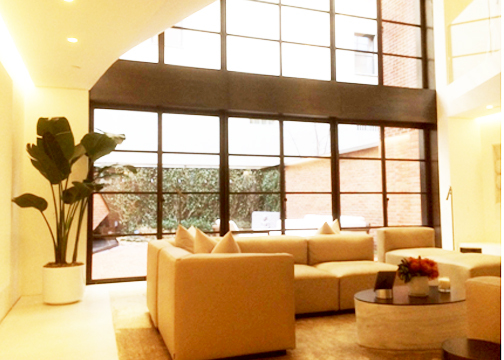 Steel Windows and Doors USA teamed up with Haute Architecture and Rusk Renovations to create a minimalist townhouse for a West Village family in New York City. Using our bronze windows, we were able to capture the beauty of the outdoor garden using our double-height windows and doors. The bronze windows, manufactured by Brombal USA, are thermally broken. These beautiful frames are bonded together using two materials: the first is a fiberglass reinforced extrusion and the second is a high-density polyurethane resin injected under high pressure. This process firmly joins the frame sections together, ensures a continuous bond, and provides maximum thermal efficiency while maximizing structural strength. The owners of this townhouse strived to make their home as eco-friendly as possible. They attempted to bring wellness into their design and wanted to enjoy a safe environment for their growing family. Fortunately, our bronze windows have great resistance to air, wind and water. They are also made from 100 percent recycled material. Our bronze products are of the highest quality, resulting in the most natural look, easily replicating historical bronze for a perfect restoration. For this minimal space, bronze windows were a great solution providing simplicity and functionality.